Terminology, definitions, basic characteristics and methods of investigation. Brief history of exploration and oceanographic investigations in the Subarctic Seas. Frontal zones in the Norwegian and Greenland Seas. Frontal zones in the Barents and White Seas. Frontal zones in the Bering Sea. Structure of hydrophysical fields inside frontal zones. Mesoscale processes responsible for the internal structure of frontal zones. Conclusions. References. Key to abbreviations. This title presents the systematization and description of accumulated knowledge on oceanic fronts of the Norwegian, Greenland, Barents and Bering Seas. The main fronts of the Norwegian, Greenland and Barents Seas are part of the climatic North Polar Frontal Zone (NPFZ). 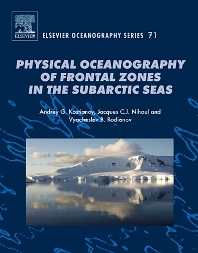 The work is based on numerous observational data, collected by the authors during special sea experiments directed at the investigation of physical processes and phenomena inside certain parts of the NPFZ and in the northern part of the Bering Sea, on archive data of the USSR Hydrometeocenter and other research institutions, as well as on a wide scientific literature published in Russian and Western editions. The book contains general information on the oceanic fronts of the Subarctic Seas, brief history of their investigation, state of the knowledge, as well as detailed description of the thermohaline structure of all frontal zones in the Norwegian, Greenland, Barents and Bering Seas and of neighboring fronts of Arctic and coastal origin. Special attention is given to the study of the multifrontal character of the NPFZ and of peculiarities of its internal structure at different locations, to the description of diverse oceanic features observed in the NPFZ, as well as to some characteristics of the horizontal and vertical fine structure of hydrophysical fields in the NPFZ. The main features of the northern Bering Sea's summer ecohydrodynamics are investigated with the help of three-dimensional direct and inverse models. Academics, graduate students and researchers in oceanography and marine sciences.